Amazon.ca popular Cyber Monday Deals Week Sale continues. For a limited time, find great savings in Electronics, Home & Kitchen, Toys & Games, Baby, Fashion, and more. 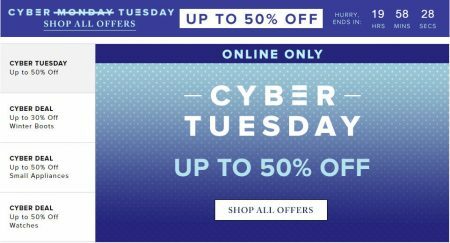 Hudson’s Bay is having a Cyber Tuesday Sale. They extended their Cyber Monday sale for 1 extra day. Save up to 50% off on over 43,000 items! Plus, save an extra $25 off your $175+ purchase when you enter code CYBER at checkout. The sale is available online-only on Tuesday, November 27, 2018. Today is Cyber Monday (Monday, November 26, 2018)! Cyber Monday (first Monday following Black Friday) is the biggest online shopping day of the year! 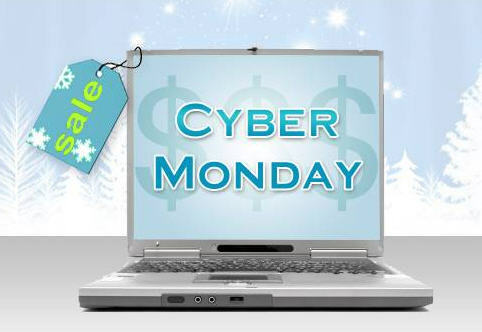 Cyber Monday online sales generated a record $6.59 billion in sales last year! Over 85% of Canadian online retailers are expected to offer terrific 1-day only online sales today. If you haven’t started holiday shopping yet, today’s the perfect day to start with all the great deals. Since it’s Cyber Monday, most deals will be available online-only today. Enjoy all the Cyber Monday savings! Amazon.ca popular 2018 Cyber Monday sale starts now! Cyber Monday deals are here. It is a great time to find major discounts on electronics and tech supplies for you and everyone on your list. Find great savings in Electronics, Home & Kitchen, Toys & Games, Baby, Fashion, and more. Be sure to visit Amazon.ca often and check out their new Spotlight and Lightning Deals throughout the day. 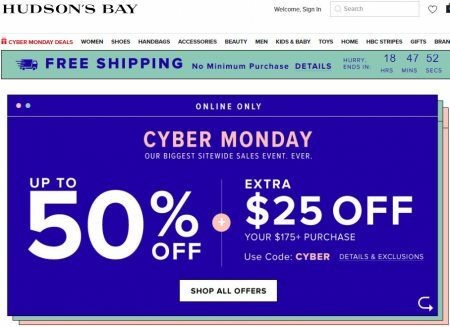 Hudson’s Bay‘s Cyber Monday Sale will be their biggest site-wide event ever! Save up to 50% off + an extra $25 off your $175 purchase + free shipping on all orders (no minimum purchase required). You’ll need to enter promo code CYBER at checkout to get the discount. I browsed around and there’s over 44,000+ items on sale! The sale is available online-only on Monday, November 26 ,2018. 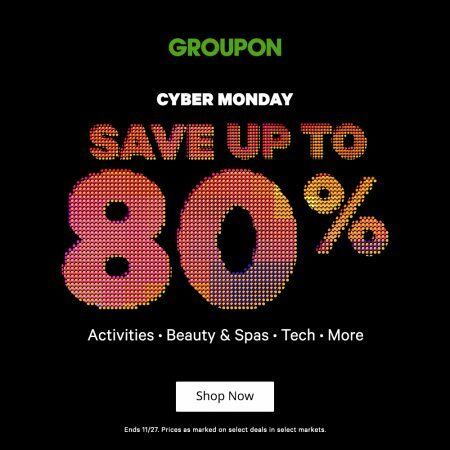 Groupon.com is having a Cyber Monday Sale. The sale is available for 2-days only from Monday, November 26th to Tuesday, November 27, 2018. Click here to shop Groupon’s Black Friday Sale. 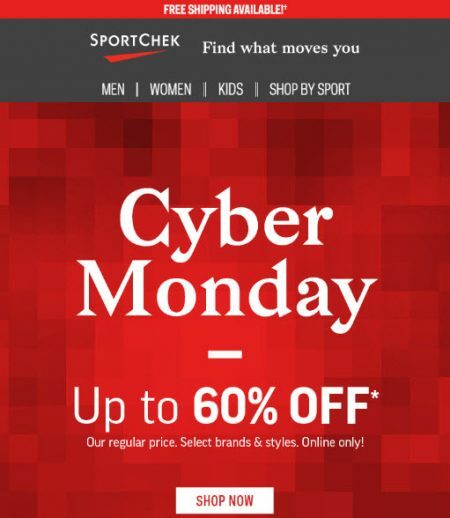 Save up to 60% off door-crasher deals + free shipping on all orders at Sport Chek during their Cyber Monday Sale! The sale is available online-only at SportChek.ca on Monday, November 26, 2018. Best Buy is having a Cyber Monday Sale. Hundreds of new deals added on top tech, luggage, baby gear & more. 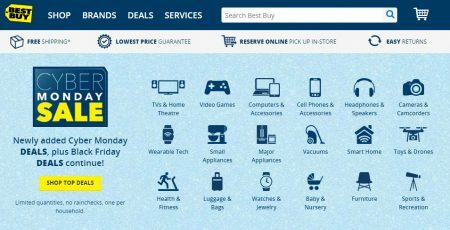 Best Buy’s Cyber Monday sale starts at 12:01am ET on Monday, November 26 and goes until Thursday, November 29, 2018. The sales are available online only. Limited quantities. No rainchecks, Limit 1 per household. Check out Best Buy’s Cyber Monday 17 page flyer to see all the deals. Click here to visit Best Buy’s website. Entertainment.com is having a Cyber Monday Sale! For a limited time,all 2019 Coupon Books are on sale for only $19 + Free Shipping! This is the lowest prices I’ve seen the new 2019 books sell for! 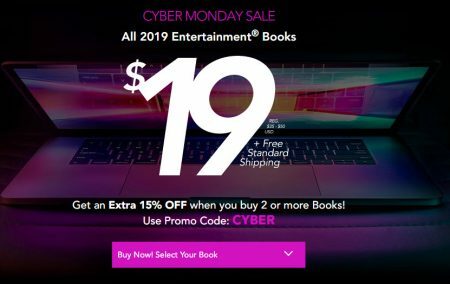 Plus, get an extra 15% off when you buy 2 or more books by entering promo code CYBER at checkout. They make great Christmas gifts! The books retails between $35-$50 each (depending on the city) so that’s a savings of up to 62% off! The sale is available online-only from November 23 to November 30, 2018. Note: Prices on Entertainment.com are in USD, so $19USD = $25.08 CAD.